Taxes. That can be a loaded word. First, let’s admit that there is a big elephant in the room with this year’s taxes and it’s name is the Healthcare Act. I want to Share how Taxes can be easy. Let’s start by introducing the elephant. It’s actually not as big as you might be thinking. First of all, don’t shoot the messenger, but you need health insurance by this Sunday, February 15th, to avoid a penalty next year on your taxes. BUT, if you have insurance through work, the only way health insurance affects your taxes is you have to check one little box. That’s right, for all my worrying, we only had to check one little box with the TurboTax filing system!!! Where did I become such an ‘expert’ (ha!)? I found answers to all my questions on TurboTaxHealth.com. They’ve got info for all the possible scenarios: Insured Filers, Marketplace Insured Filers, and Uninsured Filers. TurboTax made it so easy to navigate the Healthcare stuff. See, not so bad. 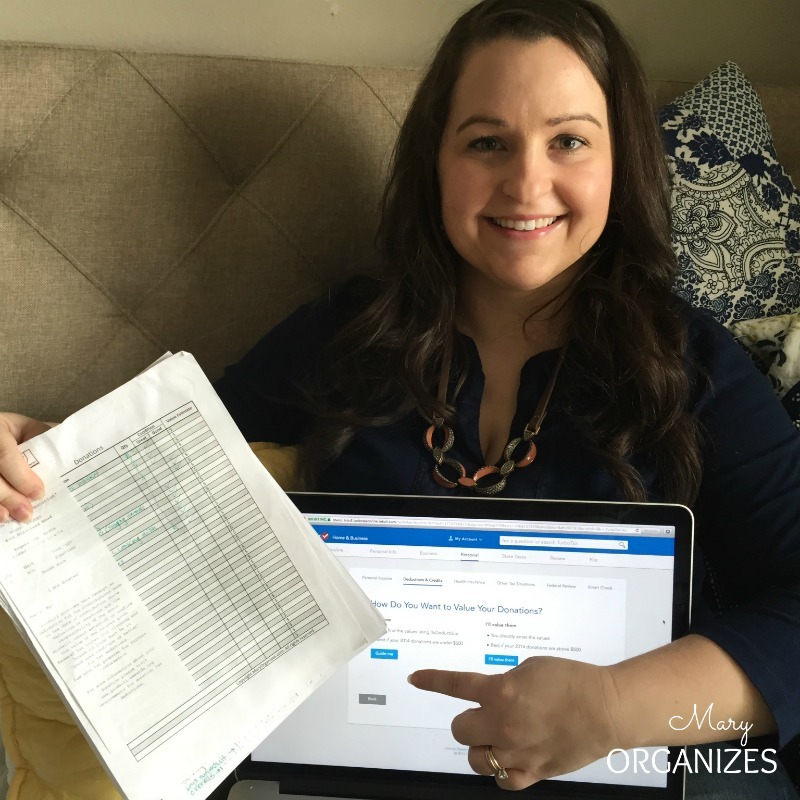 We’ve been filing with TurboTax for years because it is so easy, even as our taxes have grown more complex over the years! We have small businesses, rental property, and regular income from employers. TurboTax does it all just by asking us questions along the way. And if we don’t know how to answer the question, TurboTax explains it. Another thing that makes it so easy is the TurboTax program saves our info from year to year. It will ask us if we’ve moved or employment has changed, but we don’t have to re-enter info that hasn’t changed. This saves a ton of time every year. Even more, because we access it through the TurboTax website, my husband can work on it from his laptop to fill out part of it, and then I can open it on my laptop to do other parts. We divide and conquer and aren’t stuck working on one machine. He does all the info about his employment and the rental income, and I do other stuff, like enter in all the donations. Okay, this part is fun. A long time ago I wrote about how I setup a donation station and offered you a FREE printable to track your donations. People often ask me how I decide the value of stuff, but the truth is, I leave that part blank. I know that come tax time, TurboTax is going to do all that hard thinking for me. And you know I am all about decluttering and donating! Give away your excess when it is in good condition. Not only will it be more usable for the recipient, but your house will thank you and your bank account will thank you come tax time! This is a screenshot I took while adding in our donations. Enter information about your donation, like place and date. 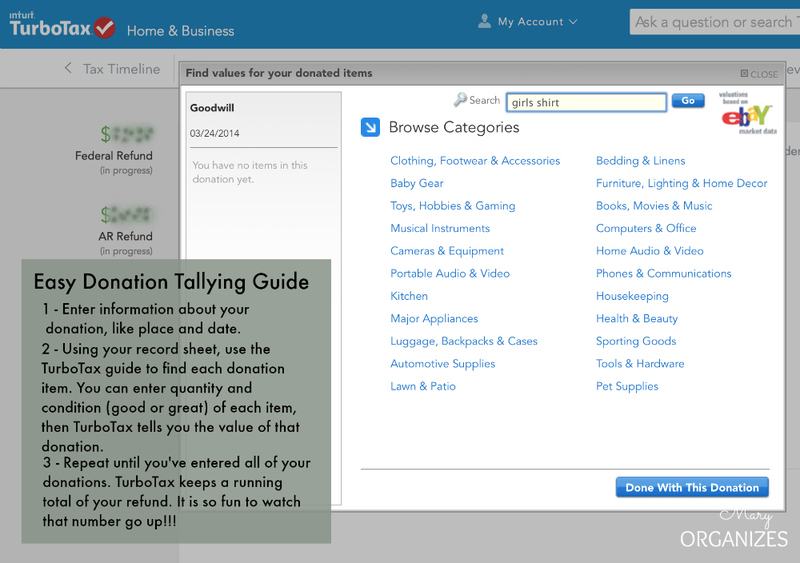 Using your record sheet, use the guide in TurboTax to find each donation item. You can enter quantity and condition (good or great) of each item, then the system tells you the value of that donation. There are two ways to find items. You can click around and find it, or enter it into the search box. Repeat until you’ve entered all of your donations. TurboTax keeps a running total of your refund. It is so fun to watch that number go up!!! If you have a simple return (1040A/EZ), go to TurboTax.com right now and file for free before February 16!! 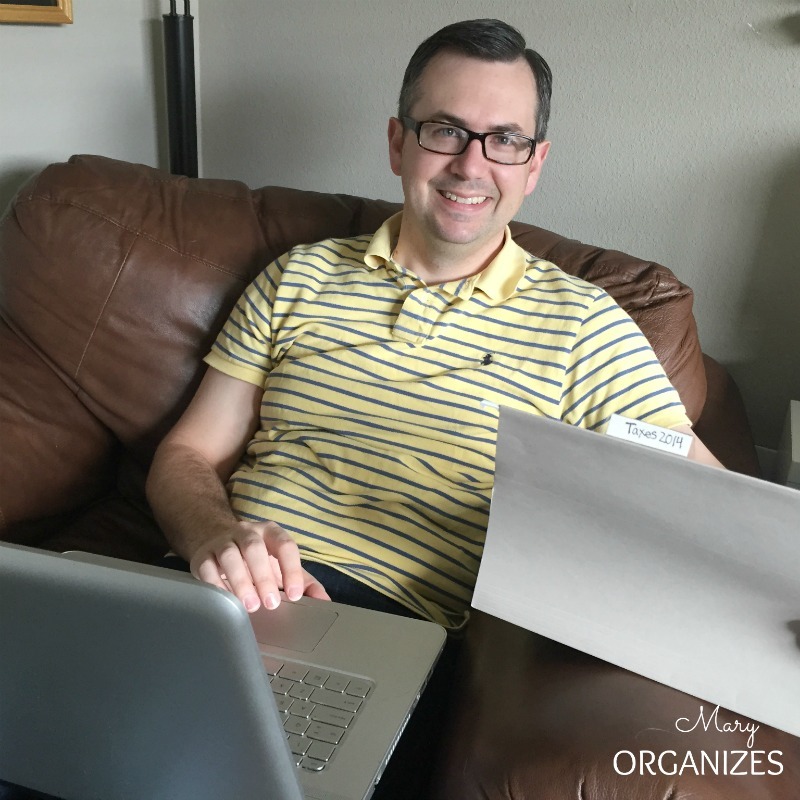 I’m so happy that we already filed our taxes, because that means our return should be coming our way soon … and that is exciting. 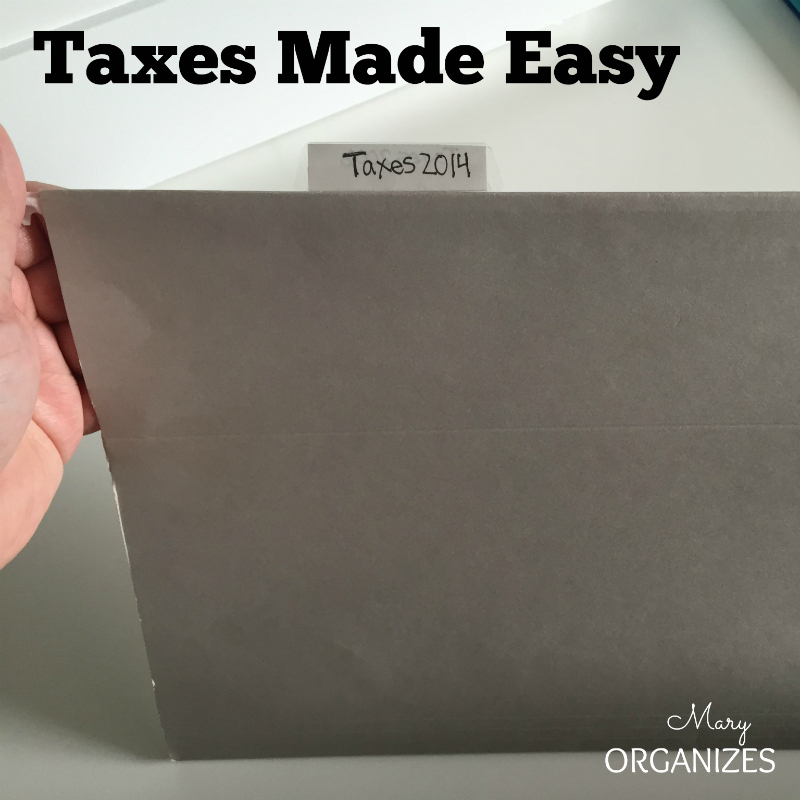 There is another little organizing trick I do all year long so that tax time is easy. I have a file folder (pictured at the top of the post) and throughout the year we put any donation papers or tax-pertinent papers straight in there. When it is time to do our taxes, we grab the file and go to TurboTax.com. Easy easy. Pretty awesome and EASY, right?! Have you filed your taxes yet? I’ve been using H&R Block. Sounds pretty similar. I love it! So easy, and cheap! Just got our HUGE refund today! Largest we ever got! YAY! Woohoo on the refund! I’m hoping by filing ours early, we’ll get it back quicker. I started several years ago having a basket inside my desk cabinet that anything tax related went into. Receipts, checkbook ledgers, calendars to track donated mileage, etc. It all goes in the basket and then I just pull it out come tax time. Sounds similar to what works for me. Doesn’t it make tax time so much simpler? !